Few things can be as fun as driving a high-speed jet ski on the sea. Whether it’s speeding over the waves or using it to follow the whales, renting a jet ski is a great way to spend a sunny day at the beach. North Myrtle Beach is an excellent vacation spot that is best experienced when driving a high-octane watercraft, with the sun on your skin and the breeze blowing through your hair. There’s a lot of jet ski rentals available near the beach. Too many, in fact, for a newly arrived tourist to know which to pick. Which is why we’ve done your homework for you and found the 3 best North Myrtle Beach jet ski rentals. 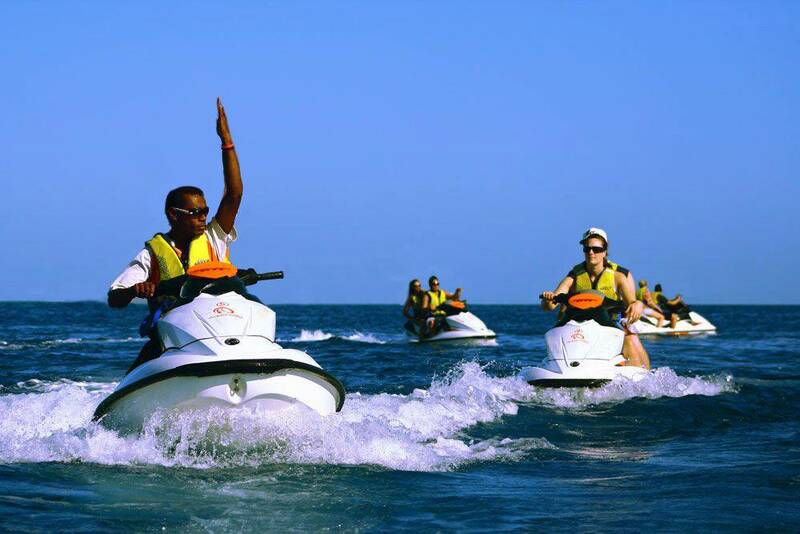 Action Water Sportz is a jet ski rental business that caters to families and large groups. The company’s jet skis can carry as much as 3 passengers per vehicle, so you can easily use them to explore and transport your family to the remote islands and beaches that land based tourists don’t have access to. Depending on your needs, jet Skis can be rented by half-an-hour, an hour, or two hours. Riders must be at least 16 years old to ride alone, but kids of any age can ride if they’re accompanied by an adult. Expert guides are available for tours and are always on the water in case that you need any help. They also plan and guide regular whale and dolphin watch trips, where you can experience and interact with these beautiful animals in their natural environment. This family operated business has a long history renting watercraft in the area and a perfect safety record without any accidents. Part of the reason for their success is their commitment to use only the best equipment. Which is why they sell their fleet every year and actualize it with the latest jet ski models. Their jet ski fleet is also kept in excellent conditions, thanks to regular check-ups and repairs. For extra security, the staff is always in the water and ready to help the clients at the smallest sign of trouble. Guides are also available if you want to take the adventure to the next level and head to the ocean, where you can get your adrenaline rush by jumping trough bigger waves. 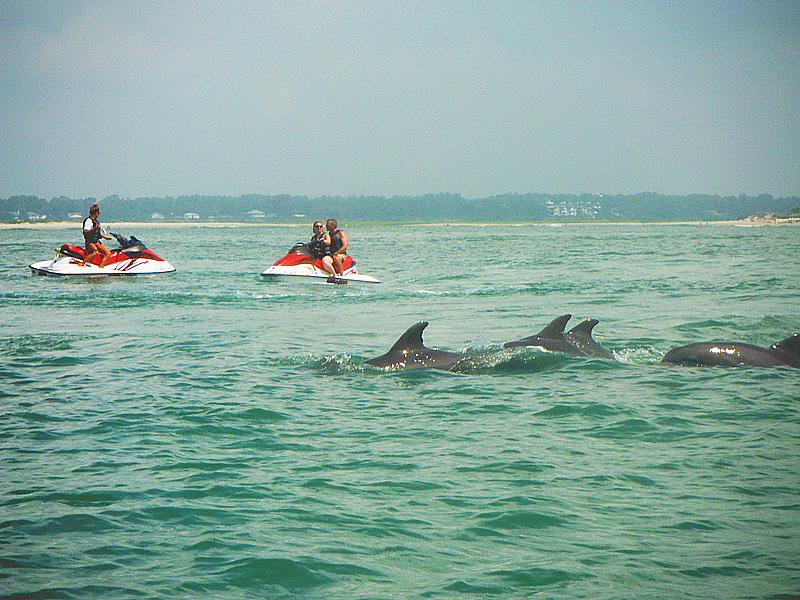 They also offer Dolphin tours where you can watch and even interact with wild dolphins first hand. 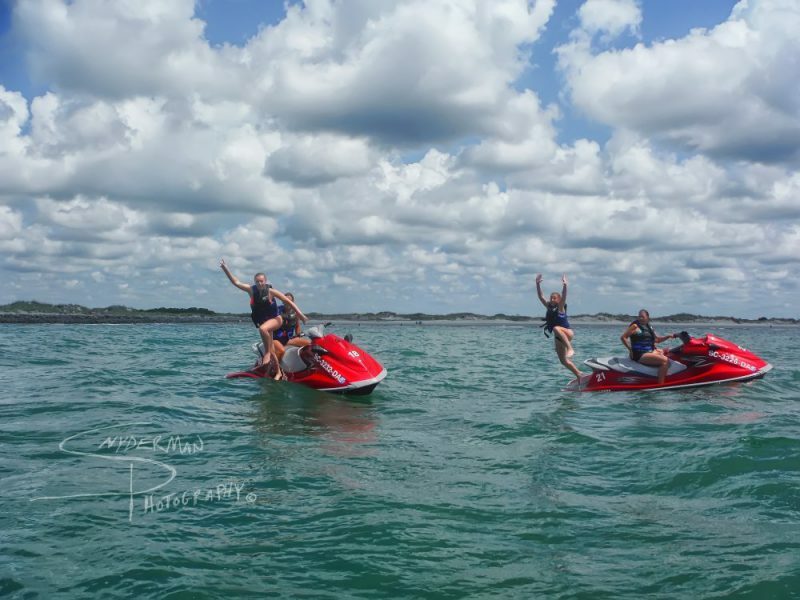 With a fleet of state-of-the-art jet skis and long experience in the watercraft rental business, Island Adventure Watersports offers one of the best ways to have fun in the water safely. Their fleet of Yamaha VX Deluxe jet skis can carry up to 3 passengers per vehicle and travel as fast as 53 MPH, making them an excellent choice to explore the area or just speed through the waves for fun. Each vehicle comes with everything you need, including safety gear, life jackets, and a full tank of gas. Guides are available and the staff is always nearby, ready to help you in case you have any problem. They also offer both ocean and backcountry tours, where you can see and experience South Carolina’s rich biodiversity first hand. Rentals are done on a first come, first served basis although it’s better to make reservations beforehand. Previous Previous post: North Myrtle Beach New Aqua Park Is Open! Next Next post: North Myrtle Beach Parasailing: Fun Above The Beach!